If the overall level of your tracks needs beefing up, this could be the solution. We can't fault Xenon. Its sound is superb, and the multitude of modes makes it ideal for any and all limiting applications that require clarity and transparency. Transparent results. Neat and tidy interface. Three dedicated transient-handling modes. Clear metering, including K-System support. Word length and dithering options. Not the cheapest plug-in on the market. PSP Audioware´s range of signal processors has long been popular, with its VintageWarmer plug-in being a particular favourite for injecting colour and warmth into a mix. 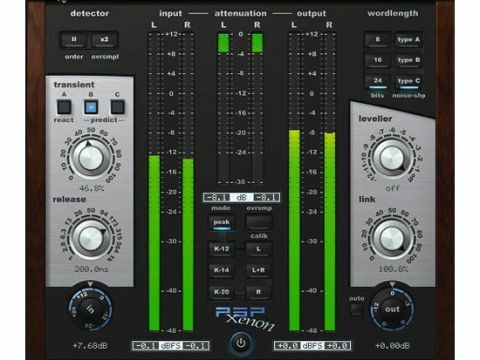 Xenon, the company´s latest effort, follows a very different path, being a stereo limiter that´s supposed to deliver a pristine and transparent sound while still beefing up the overall level. Xenon offers 64-bit processing at sample rates up to 192kHz, and is a two-stage limiter. The first stage applies initial gain reduction while allowing transients to exceed 0dBFS. The second goes to work on these ‘rogue´ transients, pulling each down using Finite Impulse Response (FIR) filter-based envelope detectors to ensure that each and every peak is dealt with accurately. What´s clear from Xenon´s GUI is that this is a limiter with many options. It´s dominated by clear input, output and attenuation meters in the central section, and these are flanked by the many controls. The Transient knob determines the attack time of the first limiting stage, and hence how large a portion of each transient passes to the second. Higher values lead to greater distortion of the transients, which can actually make them sound clearer and less squashed than at lower settings. The Release knob, meanwhile, works exactly as expected. You can select from three Transient modes for the second stage. The first of these, A (React), behaves brutally, clipping transients with no lookahead, giving a banging sound that´s suitable for most dance genres. Options B and C are tagged Predict and they do perform lookahead, employing FIR-based envelope followers to achieve subtly different responses. Preceding the limiter is a fairly slow-acting leveller stage. The Leveller dial controls the threshold of this module, which, by reducing the volume as appropriate, can be used to counteract the effect whereby loud sections of a song cause the limiter to pump undesirably. It´s a bit like ‘riding´ the input level manually. The main In knob does most of the damage, as this is where you dial in extra gain on which the limiter will work its magic. The master Out dial, matching the input´s black and blue livery, enables you to control the output ceiling, with 0dBFS the default setting. Other options include 8-, 16- and 24-bit word lengths, with four dithering styles. The Link knob yields identical gain reduction in both channels; when reduced, louder results are possible due to the channels being limited increasingly independently, at the expense of stereo stability. The Detector section further controls the envelope detectors, with Order and Oversampling buttons offering a slightly different release shape and compensation for intersample peaks respectively. Xenon is among the best-sounding and most transparent limiters we´ve come across. There´s a ‘sound for you´ somewhere in here, whether you´re looking for brick-wall loudness maximising or something more subtle. PSP is clearly hoping this will become your default limiter for mixing and mastering applications and, once you´ve tried it, there´s every chance of this happening.